Hi everyone! First part of my trip! From Thursday the 11. April till Sunday the 14. April we did a road trip from Costa Rica Tamarindo to Montezuma and Santa Teresa Beach. Today I am going to write about our first stop. Thursday morning I woke up around 8 o’clock, one hour before school. I started my classes at 9 o’clock and wrote my final exam since I finished my Spanish course that day. At around midday me and my friends were done and headed home to grab our stuff, so we could leave on time around 13.00 pm. So there we were on the road for almost 5 hours to our next stop, the little hippy town Montezuma. The nature of Costa Rica doesn’t disappoint at all! The roads in Costa Rica are not that nice. 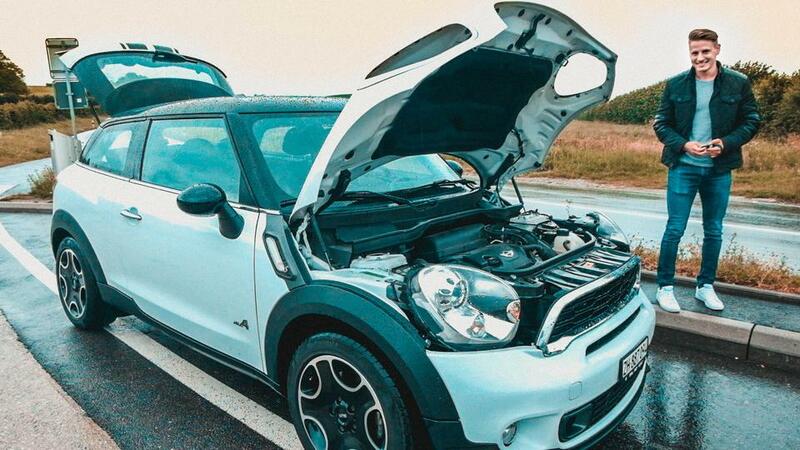 I would definitely recommend anyone to rent a bigger car like an SUV then just a small regular one. The roads can get really bumpy and together with a strong rain it will be impossible to reach your destination. Midway we had to wait 30 minutes because of street construction but other than that everything was totally fine. Singing, enjoying the view, the beautiful nature makes any road trip a memory. After 5 hours we arrived at Montezuma and checked in at our hostel right at the BEACH! 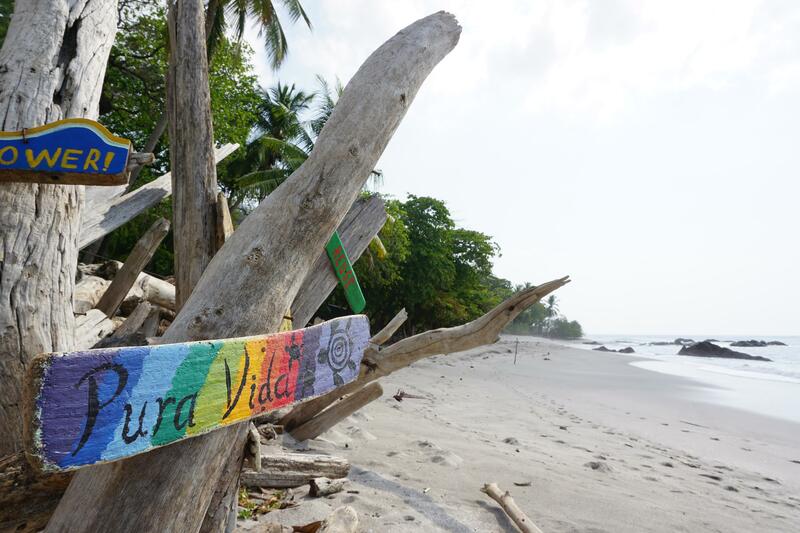 The hostel offers hammocks to chill and enjoy the sunrise and watch the waves roll in. Montezuma is not a really big town but has pretty fancy restaurants, bars and a chill vibe. There is not much around. Friday morning we woke up around 8 o’clock got some breakfast and headed out to a little waterfall track near the village. I took us a little hike up through the woods to get there. Tracking shoes might be a good idea since the rocks are sharp and steep. People climbed up that stones and jumped down from around 8 meters. It was kind of fun to watch, but imagine if something happens out there? At around 1 o’clock we headed to our next destination Santa Teresa beach to meet some friends, bt first we had to take a swim in the ocean again! I mean how beautiful is that place? So thanks for reading my blog and I hope to see you again on my channel for the second part. Happiness is not a destination, it’s a way of life! Travel the World! I have never seen so many skyscrapers in my entire live! Hi everyone! My next post is about my Brasil trip! On our trip through Brazil we stayed for 2 days in São Paolo. With the surrounding neighbourhoods the city counts 30 million inhabitants and is so far the biggest of them all. São Paulo is also the economic centrum of Brazil and stands out for its traditional architecture. It is for sure worth a weekend trip or 2-3 days visit. Within walls and buildings there are still a lot of places to explore like parks, shopping malls, restaurants and trendy areas. You like Chinese food? Just visit the Chinatown. You like to party? 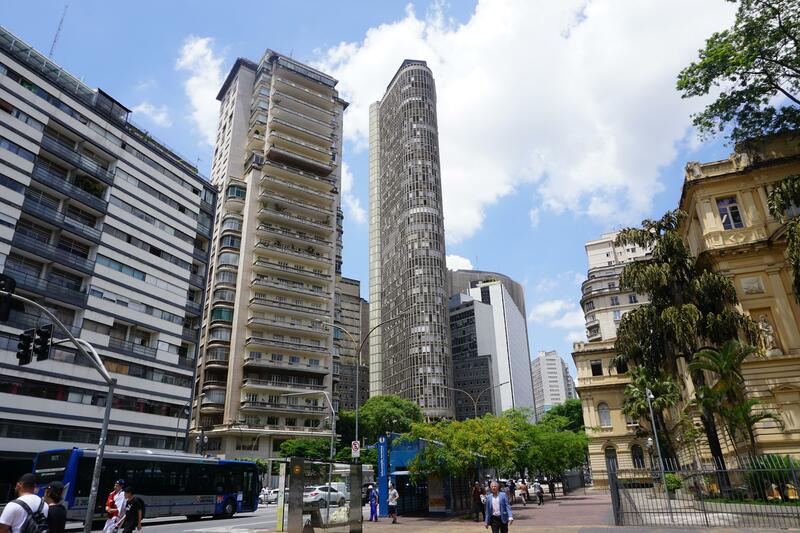 Just visit the area around the Paulista Avenue! We stayed at a big Airbnb apartment near to all nice parts of the city. There are more than 1000 buildings higher than 100 meters, so to really get a view over the city and be able to realize how big this metropolitan city really is, you have to get on top of one of the skyscrapers. In the centre we managed to take an elevator up the floors to be overwhelmed from the view. This are pictures we took from up there. I mean how is this even possible? It’s hard to imagine for a Suisse guy like me that cities like this exist. Switzerland has around 9 million inhabitants and this ‘’City’’ over 14 million. @ivansnz weh had a great time! So thanks for reading my blog and I hope to see you again on my channel. 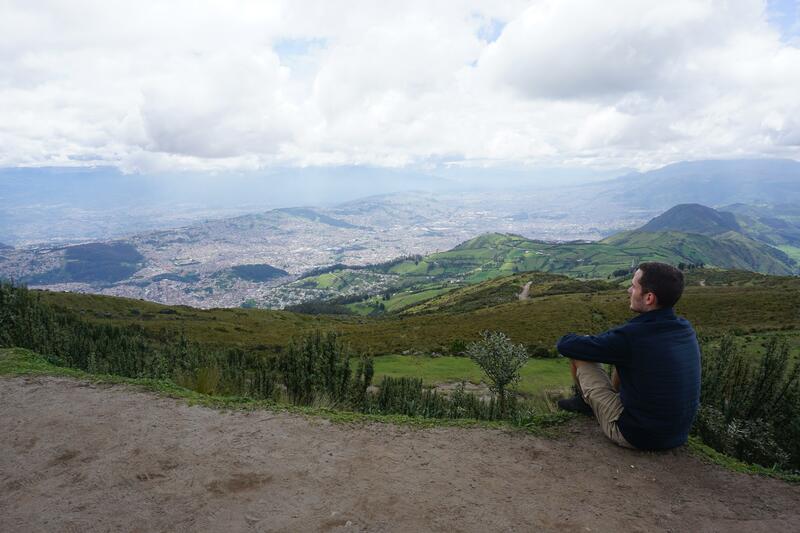 Why I loved Quito Ecuador so much! Why I loved Quito so much! So, at almost the beginning of my trip I lived for two month in a guest family in Buenos Aires for two month. We were 4 people, my hostparents and one other student from Quito Ecuador, that was studying at a university at that time. So we exchanged numbers and one week later he had to go back to Ecuador over Christmas for 3 month. Since I travelled through Ecuador I decided to text him. He was amazing. He invited me to live for free in his family’s home for 3 days. The house was huge with 5 dogs, I felt really welcomed. That they we woke up really early, I had to search my jacket since I normally didn’t need one. Woth all my stuff packed like sun cream, jacket, backpack, sunglasses and water we left with the car for a hike! Hiking up the hill? No, we took tha cable car! A good thing to know is that the city Quito is 2850 meters over sea level. We took a cable car up a mountain and ended up 4050 meters over sea level. NEVER in my life was I that much over sea level. The breathing was kind of hard and the 25 degrees were gone. It was really windy and around 6 degrees Celsius. Luckily I brought my jacket and a pullover with me. We walked around and I took some impressive shots from up there. You can see over whole Quito witch is the capital of Ecuador. This is a picture of an active Vulcano! At night, without a lot of energy left, we went out for dinner and I ordered this huge Empanada von Viento witch means Empanada with Air. Just a small part of it was filled with cheese the rest was empty and covered in sugar, but I actually liked it! Empanada con Viento, it was delicious! Thanks for reading my post about Quito, there will more! After my two month of school in Buenos Aires I started my trip in Uruguay Montevideo and my second stop was Mendoza, the home of the Malbec red Wine. Mendoza is the capital of the province of Mendoza. The City is located on the eastern side of the Andes. If you are interested in hiking, rafting, zip lining, horse riding or sports in general this is the right place for you! But what if you just like to relax and have a good time? 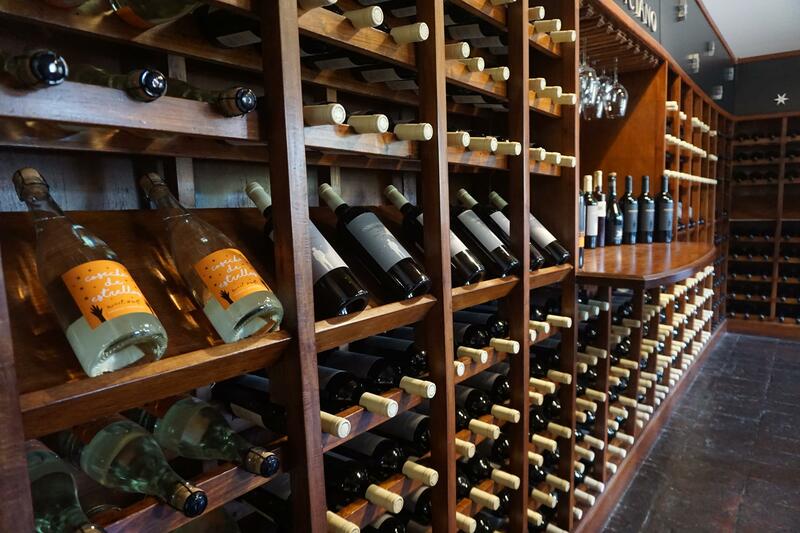 No problem, since Mendoza is also a wine region, there are dozens of vineyards, wine cellars to visit. Depending where you are staying the vineyards can be reached by bicycle, bus or taxi! They offer wine tours mostly in the mornings and show you around, explaining the production and letting you taste there originals Malbec wines! I stayed at the Lemon Tree Hostel which is outside of the city but really close to all the outdoor activity’s you might want to do! Nice rooms, a pool with a relaxing area, a kitchen and a good prise. So I booked just one night at the Hostel and a flight the next day, because I thought there is nothing to do in the city. I sadly didn’t know that in the province Mendoza you have all this outdoor activities like Zip Lining, Hiking and Rafting including al the Vineyards! So at least stay a couple days to really enjoy your stay! Be smart! A part of the information is from Source. After we landed at the airport in Denpasar, the capital of Bali, we’ve been picked up by a driver of the Conrad Bali Hotel. Arriving at the Conrad Bali resort we were already impressed by the stunning lobby! Everything skyhigh made out of beautiful wood and a view through the lobby area on the sea. Welcome drink, smiling receptionist, Check in paperwork, dropped our luggage to the lobby boy and then we arrived in our hotel room. Spacious, bold and beautiful. The view from the balcony on the pool area and the sea. nothing more to wish for. About the Conrad Bali resort? 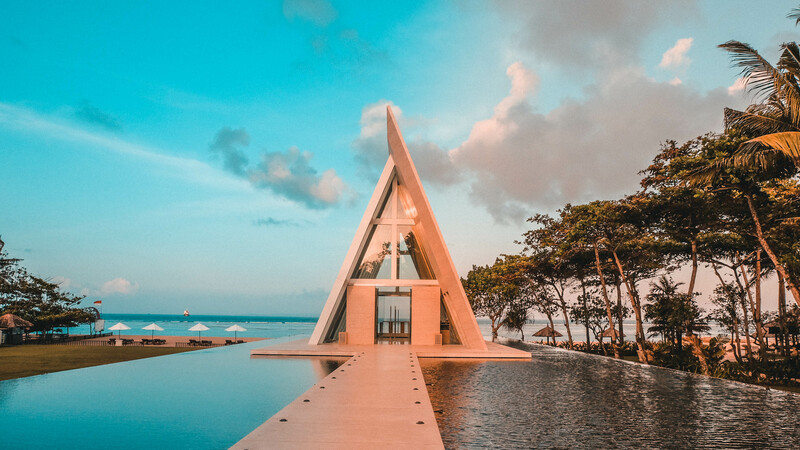 The Conrad Bali Hotel in Nusa Dua, Bali. It is a hotel of the Hilton chain. Offering beautiful rooms, suites, wedding locations, a spa and a huge pool area. Besides the relaxing offerings there is a gym and activities you can book right by the reception. Like Jet Ski, Boat trips or guided tours to near sights. This is me standing in front of the Iguazu Falls. or in Portuguese: Foz do Iguaçu. in size the BIGGEST waterfall in the world! The Iguaçu Falls or in Portuguese: Foz do Iguaçu is the world biggest waterfall. The waterfall is situated right on the boarders between Argentina, Brazil and Paraguay. 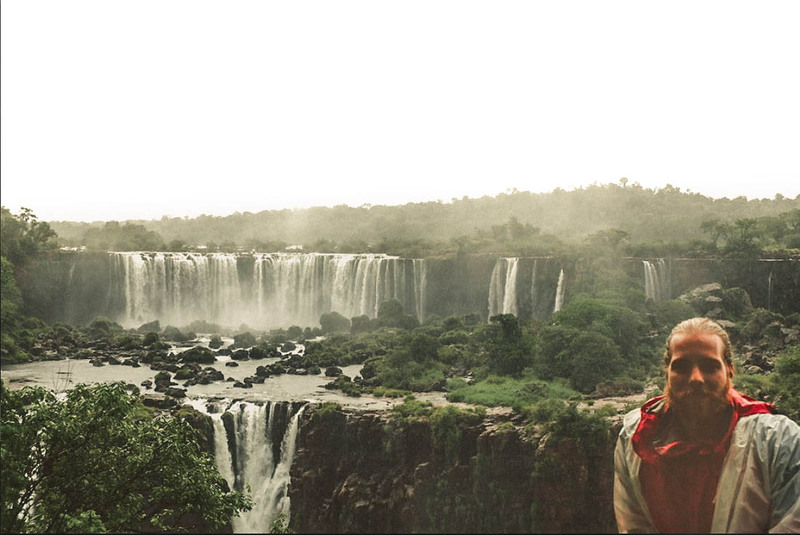 Precisely there is an Argentinian and a Brazilian side of the falls. There are different ways to explore this amazing place. Entering the park there are busses waiting for you which pick you up and brings you to a platform where you have an awesome view on the Iguazu Falls. This platform is right in front of the Belmond Hotel das Cataratas. From there you can walk straight down some pathways and stairs to the Foz do Iguaçu area. From this area a huge lift brings you up to the Restaurant's: a fast food restaurant and a buffet style restaurant. Or before taking the lift make sure to walk out the footbridge which brings you to the perfect spot right where the biggest Iguazu falls crash into each other. This spot is called Devil’s Throat. the footbridge to the Devil's Throat. How to get to the Iguazu Falls? We went on a travel Bus from Londrina. It was pretty comfortable to sleep in the Bus for 7 hours and then we arrived. But you can easily go on a plane from São Paulo directly to the city of Foz do Iguaçu. There is a little Airport. Our stay was in the city of Foz do Iguaçu too, you don’t need to stay in park itself. From the City you can easily get to the park and the Iguazu Falls with public transportation. Where we stayed in Foz do Iguaçu? We left Sydney and landed in Prosperpine Airport, from there we drove to the port of Airlie Beach. Dropped most of the luggage at the port in a local tourist office (costs only a few bucks) and went to the meeting point we've been given via mail. By the meeting point a lot of other sailors where waiting to enter the sea and sailing the Whitsunday Islands. A short instruction and we were on the catamaran. Left our carry-on baggage in our cabin. And enjoyed a beautifully prepared fruit plate. On board where besides us: three couples, the captain and a cook. We had a double bed cabin with an own small bathroom, a combination of toilet, sink and shower in one small room. After showering everything was wet. In the room we had a small sideboard to place the luggage on, a bullseye window right above the sea level and a window in the floor which enabled to see what's in the water, that was awesome. 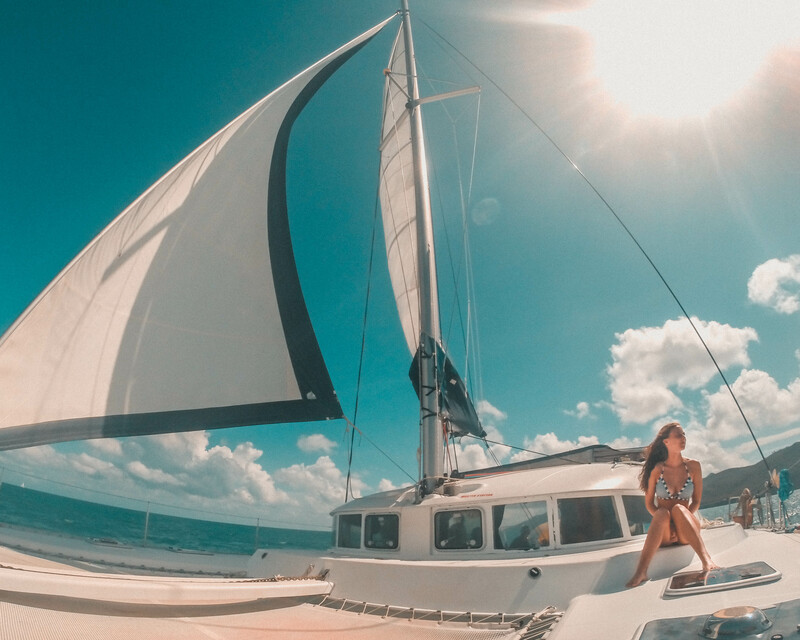 But most of the time we spent on top deck of the catamaran to feel the wind blowing, water splashing up and enjoy the view while sailing the whitsunday islands. Sometime the sea gets rough and the catamaran starts to wingle up and down. Sometimes you see a fly fish jumping out of the water and flying! over the surface. Sometimes you see a turtle gasping for oxygen. And this is the most beautiful view i've ever experienced. The view on Whithaven Beach. Different depths of the water created this mix of shades of blue. Where we stayed in Sydney? There are many options to go on day trips from Sydney. One of them is the day trip to Bondi Beach. This is the place where the famous Australian series called Bondi Beach Rescue was filmed. And as the name of the Series reveal it: Bondi has a famous Beach but the sea can get ruff there. It is easy to reach Bondi Beach with the bus. from the bus station we walked couple of minutes and arrived at the Bondi Beach Icebergs Pool. 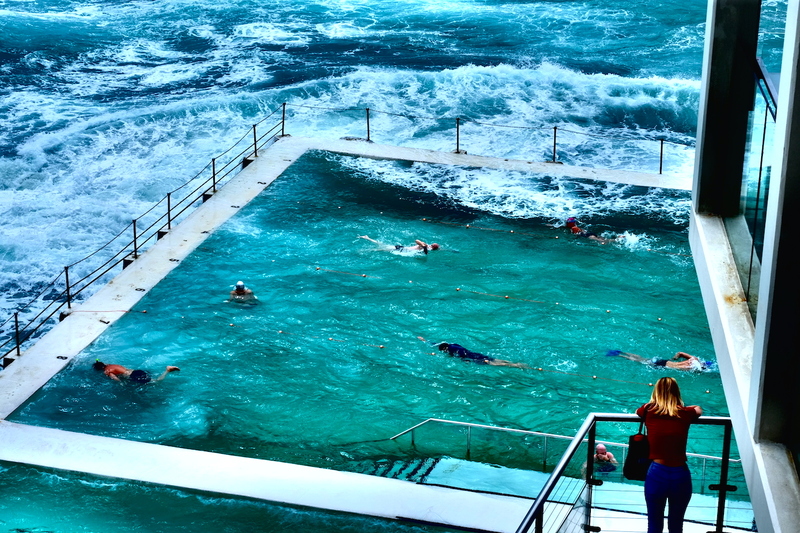 This Pool is an iconic construction which is a part of Bondi. It is a pool built right by the sea and when the tide is high, as it was when we where there, the waves clash against the pool corner and wash the swimmers with salty water. Its was so fascinating to observe how the waves splashed up against the Bondi Beach Icebergs poolcorner! Bondi Beach is a well known surf spot. With the high tide and the decent size of the waves i rent a surfboard and tried to catch some wave. it was pretty hard to ride the waves because the current was strong and the lineup crowded. Neverthless it was fun to practice! "This world has more to offer than we can explore in a lifetime. ", so what are you waiting for? go out there and explore this beautiful planet. While landing in Sydney i experienced the most impressive plane window view i’ve ever had. I could directly see the famous Sydney Opera House right beneath the Harbour bridge. It made me even more excited to explore this city. After landing you reach the Sydney city center easily with the train. We stayed in an amazing Hotel which we can recommend because of its fancy interior and it is good situated. The first thing we had to do was visiting the famous Sydney Opera House! it is really an architectural masterpiece, no matter from which angle you look at it, it always shows up in a different shape. 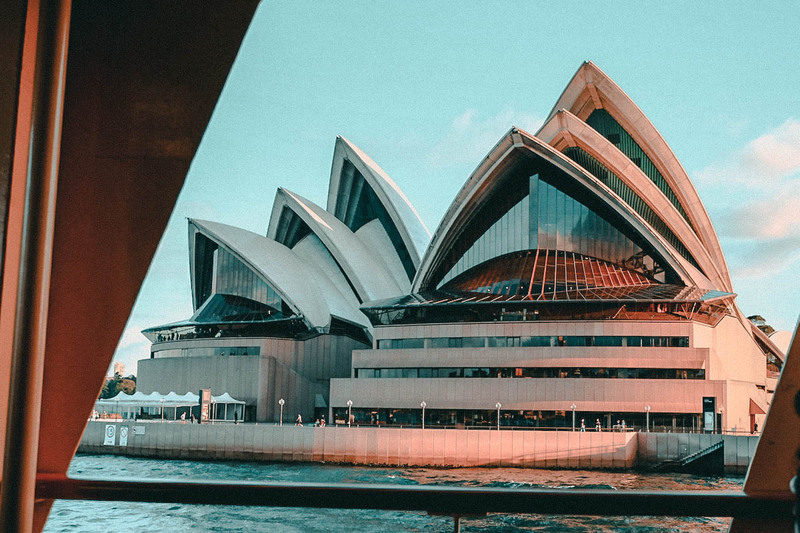 I also highly recommend to participate with an interior tour, the Sydney Opera House is inside as impressive as from the outside. I spend a week in Sydney to find out where the perfect spot to take a picture of sydney. I also cover which places to see, things to do in Sydney and this can also be used as a tourist guide.